Originally a rural agricultural area, Otterburn Park's transformation began in the late 1800s, when it became a favourite weekend destination for employees of the Grand Trunk Railway, which, starting in 1885, ran a weekend train from Bonaventure Station to Mont-Saint-Hilaire. Occasional recreational visitors, including railroad employees, bought or built summer cottages, spurring development and, eventually, permanent settlement. Until 1949, the Otterburn park was neighbourhood within Mont-Saint-Hilaire parish. It took its present name, Otterburn Park, by vote in 1953. Otterburn Park was the scene of the St-Hilaire train disaster in 1864, in which nearly 100 people were killed when an immigrant train failed to stop at an open swing bridge and fell into the Richelieu. The disaster remains the worst railroad accident in Canadian history, and the bridge is known to this day as the Pont Noir, or black bridge. The St-Hilaire train disaster was a railroad disaster that occurred on June 29, 1864, near the present-day town of Mont-Saint-Hilaire, Quebec. The train, which had been carrying many German and Polish immigrants, failed to acknowledge a stop signal and fell through an open swing bridge into the Richelieu River. Though uncertain, the widely accepted death toll is 99 persons. The disaster remains the worst railway accident in Canadian history. During the 19th century the Richelieu River served as an important waterway for trade between New York City and Montreal. Tourism also developed in the area greatly due to the steamboats that travelled up and down the river. The Belœil Bridge was built as a swing bridge so that the railway would not interrupt the shipping lanes. The bridge connects the present-day municipalities of Otterburn Park, on the river's east bank, with Beloeil, on its west bank. Other nearby municipalities are Mont-St-Hilaire, on the east bank, and McMasterville, on the west bank. On June 29, 1864, a Grand Trunk train carrying between 354 and 475 passengers, many of them German and Polish immigrants, was traveling from Quebec City to Montreal. At around 1:20 a.m. local time the train was approaching the Belœil Bridge The swing bridge had been opened to allow the passage of five barges and a steamer ship. A red light a mile ahead of the bridge signaled to the train that the crossing was open and it needed to slow. However, the light was not acknowledged by the conductor, Thomas Finn, or the engineer, William Burnie, and the train continued towards the bridge from the east. At 1:20 a.m. the train came onto the bridge and fell through an open gap. The engine and eleven coaches fell through the gap one after another on top of each other, crushing a passing barge. 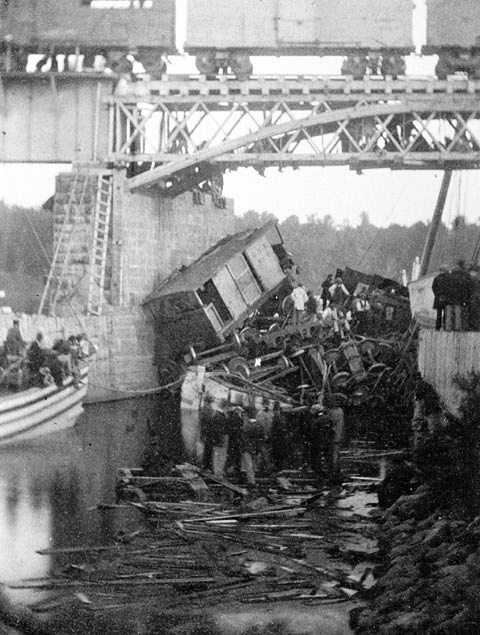 The train sank into an area of the river with a depth of 10 feet (3.0 m). 99 people aboard the train were killed and 100 more were injured. Among the dead was Thomas Finn and the fireman aboard the train. The engineer was hurt slightly in the accident but was able to escape the wreck. The Grand Trunk Railway tried to blame the disaster on the conductor and engineer for failing to obey the standing order to stop before crossing the bridge. The engineer, who had only recently been hired, claimed that he was not familiar with the route and that he did not see the signal. The Grand Jury on October 5, 1864, placed full responsibility for the disaster on the Grand Trunk Railway for negligence in failing to ensure all trains stopped before crossing the bridge as required by statute. "...the Grand Jury consider it their duty to reiterate their solemn conviction that the Grand Trunk Railway Company of Canada are mainly responsible for the melancholy catastrophe of the 29th of June last, and the great destruction of life caused thereat, and that they trust the said Company will be found amenable to tribunal for their shameful treatment of their numerous passengers on that occasion." The Grand Trunk Railway sent large numbers of men to assist the recovery and rescue efforts. Furthermore, the rescue effort was supported by members of the German Society of Montreal, the St. George's Society of Montreal, the St. Patrick's Society of Montreal and the Irish Protestant Benevolent Society of Montreal. The hospitals and other institutions in nearby Montreal were used for the injured passengers. The dead were also brought to Montreal and buried in the Mount Royal and Roman Catholic cemeteries. Otterburn Park is 25 km (26 min.) from St. Hyacinthe and 222 km (2 hrs. 19 min.) from Quebec City.